Faith Gregory, editor of Solarpunk Press, was interviewed by Sunvault, the upcoming solarpunk anthology, and that interview went online today! Even though Sunvault is closed for submissions, Solarpunk Press is another paying market looking for solarpunk stories! We talked with co-founder Faith Gregory about what solarpunk means to them. Sunvault: What drew you to solarpunk and what still inspires you? Faith Gregory: Honestly, I wasn’t initially interested in Solarpunk. Watson and I worked on the same college newspaper, and they kept bringing it up to me as something I should look into. The idea didn’t really stand out to me, but when they finally got me to look into the community and read some posts, I started to see how important the idea of optimistic speculative fiction is, and that small movements like these are key in changing the socio-political landscape of our respective communities, and how our communities interact with each other. The Handcycle has two wheels in front and one in the back, and the rider rests on their knees and on a chest support. Image from the One-Off Handcycles website. Mike Augspurger is the founder of One-Off Handcycles, a business that makes Handcycles for disabled people to ride on rough terrain. “Up until recently I built and sold custom titanium bikes frames, and then after that I built and sold my own design for an off-road Handcycle, which is for people in wheelchairs,” said Augspurger. Augspurger’s Handcycles usually weigh around 50 lbs, weight varying on wheels, seating and various components, and tend to be about 70 inches long. The frame is made of chrome moly steel. “It’s a generally three-wheeled vehicle that’s arm powered, we like to think of it as the equivalent of a mountain bike for people who are in wheelchairs,” said Augspurger. The handcycles are designed for rough terrain, but they also work on roads and bike paths. Augspurger became fast friends with his neighbor Bob Hall, who was the first person to enter the Boston Marathon in a wheelchair, often thought of as the grandfather of wheelchair racing. “I learned from Bob about all these various kinds of wheelchair sports, and I always thought if I were in a wheelchair, what I would want is an off-road Handcycle. And I knew that they didn’t exist, so it was kind of compelling to make my own design,” said Augspurger. The Handcycle Augspurger designed has two wheels in the front and one in the back, using rear-wheel drive, as opposed to having one wheel in the front and two in the back, using front wheel drive. This is to maximize control at high speeds and sharp turns for the rider. Augspurger had local wheelchair athletes test them out to make sure the models actually work for people with disabilities. He said disabled people think of things to test on the Handcycle that able bodied people wouldn’t even think to try. The hardest part of designing the Handcycle was how the rider would steer and crank with their hands at the same time. Augspurger designed a chest support for the Handcycle, because a lot of paralyzed people aren’t just paralyzed from the waist down, but from the stomach or mid chest down, so they couldn’t be sitting up while riding. Augspurger had one of the wheelchair athletes come over to test out the chest support while riding the Handcycle. He had attached the support with hose clamps. Augspurger's design is the only kind of Handcycle that’s not a recumbent, a wheeled vehicle where the rider lays on their back and pedals. 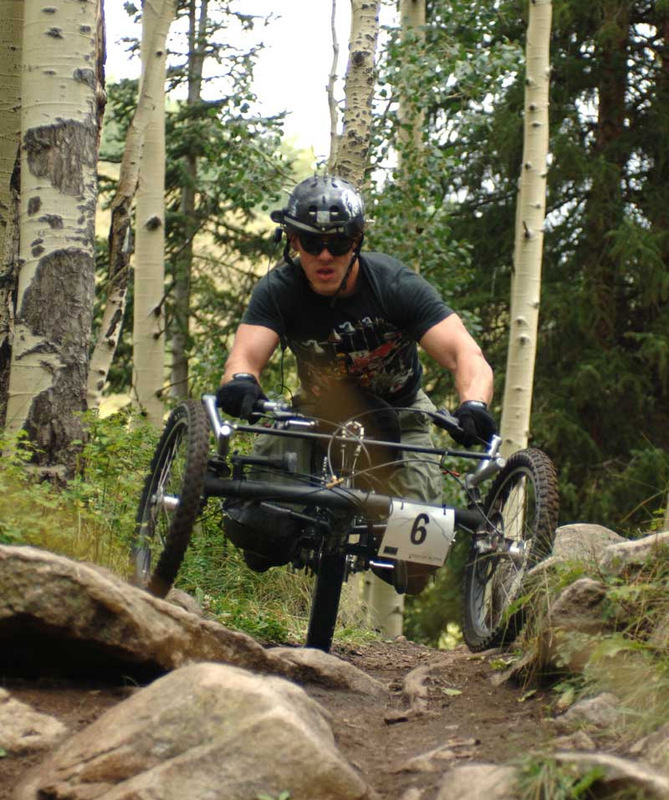 In 2006, Augspurger sponsored the first ever off-road Handcycle race in Colorado. Eleven athletes competed, all on his Handcycles. There were 10 years in between when Mike made his first design sketches for his Handcycle -- which has been structurally almost the same since the beginning -- and when he actually had the resources to start working on it. "I subscribed the the wheelchair magazine and every month I would sort of panic, get it out of the mailbox and look through, because I expected somebody else was going to beat me to it. And then, twenty years later, I think, 'God, I wish somebody else would make these.' For ten years I'd think, 'how many of these do I have to make?' I'd rather make them better, or make a slightly different version, instead of just taking orders and making the same thing again." Ausburger is no longer in business, but a few other business sell models based on his designs. He said all of those organizations has offered to pay him licensing fees, but currently he isn't asking any of them to pay for their permission to use the patent. When he gets requests now, he sends people to Jake O'Connor, and his company Reactive Adaptations. He said it's common for athletic equipment for people with disabilities to just disappear as soon as the first company to make them stops producing them. "There was a water ski for a while that you kneel on, it built up into a whole sport ... but the people who were making the water ski stopped and nobody else would do it so the sport just died." More information on One Off Handcycles can be found at oneoffhandcycle.com including photos and videos.